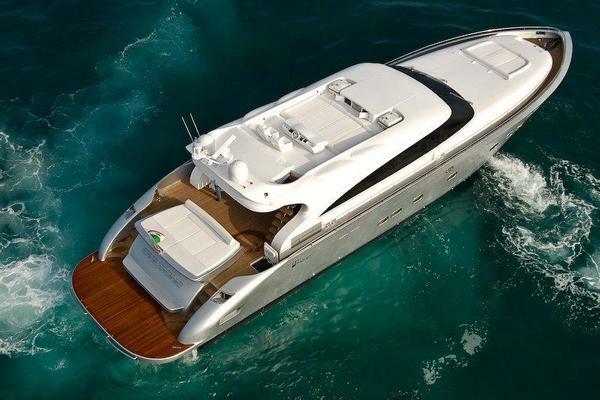 "JEANNINE D" is 98' fiberglass motoryacht built by Destiny in 2001. She features a 4 cabin layout accommodating 8 owners/guests, and is powered by 2x MTU 16V2000's, 1800 hp, with cruising speed of 21 knots, and max 23 knots. high gloss woods and silk fabrics, an overstuffed freestanding L-shaped sofa which seats 4 to 6 people, 2 chairs and a fully equipped bar with 4 high chairs. The bar countertop is granite and includes an ice maker, refrigerator, glass storage and an area for liquor storage. A circular staircase forward of the bar leads to the lower deck. VCR, CD player, AM/FM Linn stereo tuner and ample storage for videos and CDs. Forward to port is the dining area which has a circular dining table with eight freestanding chairs, marble floor and has a built-in storage area for china and cutlery. The interior woodwork is Cherry with Maple Burl accents done by Elegance and Wood. The galley is forward portside for easy and unobtrusive crew service to the dining area and salon. The galley features granite countertops and backsplash along with granite flooring, a 4 burner ceramic cooktop and oven, microwave/convection oven, waste disposal, Hansgrohe single lever faucet, full-size refrigerator/freezer with ice maker and chilled water dispenser, dishwasher and trash compactor. The on-deck day head has a beautiful gold sink and marble countertops. The faucets and door knobs throughout the boat are made by Serdaneli, Jado, and Hansgrohe. wardrobes with full height beveled mirror doors, and a huge athwartship master head. His and her head feature sinks with marble countertops and backsplash and flooring, a fully equipped shower. The entrance to the pilothouse is starboard on the main deck with a midship steering station and a comfortable L-shaped settee which will comfortably seat 56. The floor is teak and holly and the Recaro pilothouse chair is electric. bed with a padded fabric headboard with mirrored panels above, a pair of 3 drawer bedside, a settee and a vanity with flip-up makeup mirror. bed and nightstands with 3 drawers, an entertainment center which includes a 20" TV, DVD player, CD player and AM/FM tuner and full height, cedar lined closets. The guest head has a fully equipped shower stall with a marble floor and a single sink with a marble countertop and backsplash. To starboard is a guest suite with 2 twin beds, a single nightstand with 3 drawers, a cedar lined, full height closet and an entertainment center with a 20" TV, DVD player, CD player, VCR and tuner. The head has a marble shower stall, a single sink with a marble countertop and backsplash, and marble flooring. Forward is a crew galley/laundry lounge with two berths, a full-height wardrobe, a settee, a fixed Corian table top, 20" TV/VCR, and head with shower. The galley/laundry area has a sink, refrigerator, washer and dryer and built-in Ironing board. The crew mess has carpet floor. Forward of the settee is a watertight door for direct access storage compartment with deep freezer unit. To starboard is the captain's cabin with a double size bed, full-height wardrobe with mirror, head and TV/VCR/stereo system and to port a set of crew bunks. The flybridge has a helm station to starboard with two bench seats that will accommodate 3 people comfortably. Aft of the bench seats is a wet bar, a stainless steel barbecue grill, dining area and Jacuzzi. Aft of the Jacuzzi is a storage area for the tender and wave runner. The aft deck seating area has a teak table; 4 teak chairs and a settee that will comfortably seat 8.
port is a dining area with an over-sized round table for eight. Aft of the dining is a large L-shape sofa and 2 occasional chairs. The entertainment system includes a 46" HD TV that can easily be concealed by a Tambour Door, surround sound stereo, 200 disc CD player, DVD player, Hi Fi,VCR, AM/FM stereo tuner, multi amplifier and fully programmable remote system. 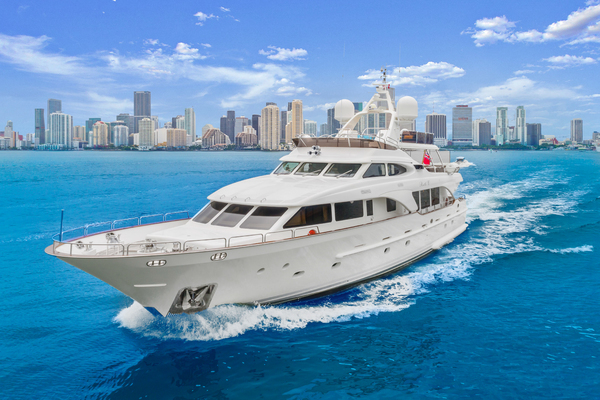 The master has a king size bed and is at the aft end of the suite and looks forward to a half height electric pop-up bulkhead that houses a 32' plasma TV and entertainment center. A few steps down on the starboard side leads you to a large mirrored closet and dressing area and huge arthwartship master head which has a separate glass and cherry framed enclosure for both head and shower. The linens are Pratesi. A pair of his and hers sinks are set into an athwartship onyx counter complementing the slightly lighter onyx flooring. The VIP stateroom is an aft full beam stateroom with a king size bed with padded fabric head board and mirrored panel above, vanity, settee, stereo and a 27" TV. This stateroom has a "Walk Around" queen size bed with padded fabric headboard with mirrored panel above, along with a fabric padded bed base with concealed lift and pull drawer access to storage space beneath. There are two nightstand units with 3 drawers and burl veneer top. The entertainment center includes a TV, DVD, VCR and stereo system which includes a CD player. A full height cedar-lined wardrobe is features in this stateroom. The second guest staterooms has two single beds with padded headboards and mirrors above along with storage space beneath the beds. Included is a 20" TV, DVD, VCR and stereo with storage space for videos, cd's, etc. The wardrobe is full height and cedar lined. The full beam salon/dining/bar area is almost 600 square feet. It features an Evan Marshall Interior with Roman shades and stainless light sconces, custom Savage Lighting, granite counter tops. To starboard is a sit down high granite bar with 4 freestanding chairs. The fully equipped bar offers an icemaker, bar refrigerator, glass storage and liquor storage. To port is a dining area with an over-sized round table for eight. Aft of the dining is a large L-shape sofa and 2 occasional chairs. The entertainment system includes a 36" HD TV that can easily be concealed by a Tambour Door, surround sound stereo, 200 disc CD player, DVD player, Hi Fi VCR, AM/FM stereo tuner, multi amplifier seeker and fully programmable remote system. The fully equipped marble counter galley is immediately forward for easy and unobtrusive crew service to the dining area and salon. The countertops are granite with full height backsplash. New appliances, freezer, water heater and granite floor have been installed. Theraisedpilothouseisaccessedfromthemaindeckstarboardentryareaandhadamid-ship steeringstationwithallelectronicsarrayedacrosstheforwardpanelbelowthewindshield. Visibility is excellent forward and to both sides. A comfortable L shaped settee will comfortably seat five or six. The floor is teak and holly, electric Racaro pilot seat, and "additional" a/c system for pilothouse.